The Santiago Bernabéu Stadium (Spanish: Estadio Santiago Bernabéu Spanish pronunciation: [esˈtaðjo sanˈtjaɣo βeɾnaˈβeu̯] ( listen)) is a football stadium in Madrid, Spain. With a current seating capacity of 81,044, it has been the home stadium of Real Madrid since its completion in 1947. The Santiago Bernabéu is one of the world's most famous football venues. It has hosted the final of the European Cup/UEFA Champions League on four occasions: in 1957, 1969, 1980 and 2010 and hosted the second leg of the 2018 Copa Libertadores Final. The final matches for the 1964 European Nations' Cup and the 1982 FIFA World Cup, were also held at the Bernabéu, making it the first stadium in Europe to host both a UEFA European Championship, a FIFA World Cup final and a Copa Libertadores final. The next big changes did not occur until the early 1980s with the hosting of the 1982 FIFA World Cup in Spain. The stadium had to adapt to the changing times and with this, architects Rafael Luis Alemany and Manuel Salinas were hired for the stadium's renovation project. The brothers were sons of Luis Alemany Soler, who carried out the original construction project next to Muñoz Monasterio. The work lasted 16 months and had a cost of 704 million pesetas (US $4.7 million), of which 530 million was paid by the City of Madrid. The improvements included a number of points. First, FIFA forced two-thirds of the seating area to be covered. For this reason, Real Madrid installed a roof covering the perimeter of the first and second tiers of seating, except the east side. The stadium's capacity was reduced from 120,000 to 98,000 spectators, 24,550 of which were covered by the new roof. The project also involved remodeling the façade, the installation of new electronic signs in the north and south ends, as well as the renovation of the press areas, lockers rooms, access, and ancillary areas. The stadium hosted four matches in the World Cup: three second-round Group Two matches (West Germany vs. England, West Germany vs. Spain, and Spain vs. England) and the prestigious final match (Italy vs. West Germany). Following a series of spectator fatalities in the 1980s (most notably the Heysel Stadium in Belgium and the Hillsborough Stadium in England), English authorities released the Taylor Report on how to improve football spectator safety in English venues. UEFA followed suit across Europe. The stadium was forced to create separate shortcuts to different stadium sections and seats for all spectators. In the 1990s, the Santiago Bernabéu went through a large expansion and remodeling. The board of Ramón Mendoza awarded the project to Gines Navarro Construcciones, S.A. The work started on 7 February 1992 and concluded on 7 May 1994 with a final cost of more than 5 billion pesetas, substantially raising the debt of the club, having no institutional support. The work concluded with the creation of an amphitheater on the west side and in the foundations, coupled with the existing building by using hydraulic jacks. In total, 20,200 upgraded seats were installed, with each seat having a tilt of 87 degrees, ensuring a perfect view and proximity to the pitch. In addition, to access the new ring, four entrance towers were erected on the outside, each with two staircases and a central spiral ramp. With the new structure, the height of the stadium was increased from 22 m to 45 m. This caused problems during the winter, leaving two-thirds of the field of play in the shade. This lack of sunlight led to grass deterioration on the pitch. For this reason, a polypropylene pipe network was installed at a 20 cm depth under the pitch. At over 30 km long the pipe system circulates hot water, keeping the turf from freezing in cold temperatures. Also, due to the height of the stand, it was necessary to improve and increase the lighting capability. A retractable protective roof was also installed to protect the fans from the elements. After the renovation, the stadium's capacity was 110,000 spectators. Already in the summer of 1998, and chaired by Lorenzo Sanz, the Santiago Bernabéu adopted an all-seating arrangement, bringing its capacity down to 75,328 spectators. As the club kept growing in all regards, thoughts for further changes to the stadium appeared. When Florentino Pérez became the president of the club, he launched a "master plan" with one goal: to improve the comfort of the Santiago Bernabéu and the quality of its facilities, and maximise revenue for the stadium. Pérez invested €127 million in five years (2001–2006) by adding an expansion to the east side of the stadium, as well adding a new façade on Father Damien street, new costumes, new boxes and VIP areas, a new stage in honour of the east side, a new press area (also located on the east side), a new audio system, new bars, integration of heating in the stands, panoramic lifts, new restaurants, escalators in the tower access, and implementation of the multipurpose building in Father Damien street. Following the enlargement of the lateral east side and the creation of new galleries, the capacity of the Santiago Bernabéu was 80,354, all seated. In 2007, the 1,000th match was played at the Santiago Bernabéu. In addition, the latest revision of UEFA on 27, on the occasion of Champions League match against Olympiacos, served as a final step to give the Santiago Bernabéu elite stadium status on 14 November 2007, a month before the celebration of the 60th anniversary of the inauguration of the stadium. UEFA announced that the club will officially rename the elite stadium. Pérez proposed construction of a retractable roof before he resigned in 2005. In 2009, following the re-election of Pérez as the club president, it was announced that the roof construction was looking unlikely due to the financial situation of the club. According to Spanish sports newspaper Marca, however, Pérez wants to restructure Santiago Bernabéu. According to the newspaper, the architect in charge will be chosen from among a shortlist of Spanish architects Santiago Calatrava and Pritzker Prize-winner Rafael Moneo, and Chinese-American Ieoh Ming Pei, also a Pritzker winner. According to the official website of the club, the current capacity is 81,044. On 16 October 2013, Pérez announced that Real Madrid was seeking to sell the naming rights for its stadium and looking for a sponsor for the €400 million renovation project. The proposed design of the stadium renovation, produced by German architects GMP, was unveiled on 31 January 2014. The bold design includes a retractable roof, with the overall cost of around €400 million likely to be met half via the sale of naming rights and half via a bond issue to Real members according to Spanish media reports. Pérez said, "We want to make the Santiago Bernabéu the best stadium in the world." Real Madrid then announced a sponsorship agreement with IPIC to assist the club in the redevelopment of the stadium. Pérez then said that in compliance to the agreement the name of the stadium would be renamed "IPIC Bernabeu" or "CEPSA Bernabeu". The surface has been replaced with Mixto hybrid grass. Real Madrid and Microsoft launched the first interactive audioguide for the Bernabéu Tour on 3 April 2017. Over 200,000 people toured the stadium in 2016, of which over 60% were foreigners. The €525 million project was set to begin in summer 2017, but it was delayed and is now set to start in mid-2019. The capacity will not be increased and will remain at 81,000 seats. It is still unknown what will be the name of the stadium, as it will change due to the sponsorship agreement. The stadium will grow ten metres in height and the roof will be added. The work is expected to last three and a half years (2019-2023). In order for the project not to get in the way of playing matches, the team will use Roman techniques with raising the top, which will make it easier for the works to continue while the season is underway and there are matches once or twice a week. "The project is complex because it will not stop the football and therefore complicates the works and design, which has a roof that encloses the whole stadium. They are going to lift the roof like the Romans did, but with modern technology. They will raise the inner ring by string-pulling with hydraulic jacks, bridge technology and ski lifts in a short period of time in the summer to respect the sporting calendar," said Tristán López Chicheri, the individual in charge of renovation. Chicheri believes the renovation will bring tourists to the stadium all year round, with many attractions planned. The stadium is supposed to have more restaurants, a shopping centre and a hotel, with some rooms having a view of the pitch. 'Digital stadium of the future' will be equipped with a 360-degree screen and retractable roof. "It is not only on matchdays that it will be used – there are venues like the Bernabéu that are in the middle of the city and it is a shame that they have no life beyond 35–40 matches a year," said Chicheri. The areas around the Bernabéu will be rearranged: the Plaza de los Sagrados Corazones will be removed to be replaced by 6,000 square metres of gardens. The stadium is located in the district of Chamartín of Madrid. It occupies the block bounded by the Paseo de la Castellana and the streets of Concha Espina, Padre Damián, and Rafael Salgado. Nearest subway station is Santiago Bernabéu on the Line 10. The stadium is served by its own metro station along the Line 10 called Santiago Bernabéu. It is also served by bus routes 14, 27, 40, 43, 120, 147 and 150. The stadium is 8.2 miles (13.2 km) away from Barajas International Airport. Santiago Bernabéu hosted three matches of the 1964 European Nations' Cup, a tournament which Spain hosted: one qualifying match and two in the main tournament, including the final. All of the matches involved Spain. The stadium hosted one qualifying round match against Romania, which resulted in a 6–0 win. The stadium hosted two matches of the tournament, including the final. The match was contested by the 1960 winners, the Soviet Union, and the hosts, Spain, at the Santiago Bernabéu Stadium in Madrid. Spain won the match 2–1, with goals coming from Jesús María Pereda and Marcelino. Galimzyan Khusainov scored for the Soviet Union. In the 1982 World Cup held in Spain, the Santiago Bernabéu Stadium hosted four matches: three in the second round (West Germany–England, West Germany–Spain and Spain–England) as well as the final between West Germany and Italy. The stadium hosted three second round matches. The 1982 FIFA World Cup Final was a football match contested between Italy and West Germany. It was played on 11 July 1982. After a scoreless first half during which Antonio Cabrini fired a penalty low and wide to the right of goal, Paolo Rossi scored first, heading home a bouncing Claudio Gentile cross from the right from close range. Marco Tardelli then scored from the edge of the area with a low left footed shot before Alessandro Altobelli, at the end of a counterattack by winger Bruno Conti, made it 3–0 with another low left footed shot. Italy's lead appeared secure, encouraging Italian president Sandro Pertini to wag his finger at the cameras in a playful 'not going to catch us now' gesture from the stands. Paul Breitner scored for Germany in the 83rd minute, firing low past the goalkeeper from the right, but Italy held on to claim their first World Cup title in 44 years, and their third in total with a 3–1 victory. The front of the stadium. This match was contested between Real Madrid, champions of Spain, and Fiorentina, champions of Italy. In this season, 16 teams played for the trophy. Real Madrid won 2–0 in the final after goals from Alfredo Di Stéfano and Francisco Gento in the second half. This was the second consecutive European Cup for Real Madrid after having won his first trophy one year before, in the Parc des Princes against Stade de Reims. This year Milan, champions of Italy, played Ajax, champions of the Netherlands, to determine who would be the champions of Europe. Milan defeated Ajax 4–1 to win their second European championship. Ajax made history by being the first Dutch team to reach a final. In this final, defending champions Nottingham Forest of England faced Hamburger SV, champions of Germany. The match ended with a victory for the English team with a 1–0 result. The new champions of Europe retained the trophy and achieved a historic second consecutive European Cup. A game played between two best teams in the Champions League which consists of group stage and knock-out stage. The final is played at a different stadium each year. In 2010, Bayern Munich, who eliminated Lyon in the semi-finals, faced Internazionale, who defeated Barcelona in the semi-finals. Inter won 2–0 after two goals from Diego Milito. The two-legged 2018 CONMEBOL Libertadores final pitted Argentine archrivals of Buenos Aires in Boca Juniors and River Plate against each other in the final for the first time. The first leg was held at Boca Juniors' home pitch, La Bombonera, on 11 November 2018, ending in a 2–2 draw with no away goal rule applied. During the planned second leg on 24 November 2018, scheduled for El Monumental, the home pitch of River Plate, numerous River Plate fans threw glass bottles and stones at the Boca Juniors team bus headed to the stadium, injuring numerous players as a result. CONMEBOL postponed the match and moved the second leg to Europe for 9 December 2018 in Madrid, a neutral site, for security and travel reasons. Both sets of fans attended the match as River Plate won 3–1 after extra time (5–3 on aggregate) to lift the trophy outside of South America for the first time and flew to the UAE afterwards, arriving for the 2018 FIFA Club World Cup with sufficient time. ^ "Estadio". Real Madrid. Retrieved 5 May 2018. ^ a b c "Santiago Bernabéu Stadium | Real Madrid CF". Real Madrid C.F. - Web Oficial. Retrieved 26 August 2017. ^ "The Bernabeu: Back to the future". CNN. ^ "Madrid and Hamburg awarded 2010 finals". UEFA. 28 March 2008. Archived from the original on 31 March 2008. Retrieved 28 March 2008. ^ "Final de la CONMEBOL Libertadores 2018 se jugará el domingo 9 de diciembre en el Santiago Bernabéu de Madrid". conmebol. Retrieved 30 November 2018. ^ (in Spanish) Un nuevo Bernabeú galáctico. Yahoo! EuroSport, 11 September 2009. ^ "Real Madrid "working on" Bernabeu naming rights partner – Perez". goal.com. 16 October 2013. Retrieved 24 October 2013. ^ "Real Madrid reveal £330m design for new Bernabeu stadium". BBC Sport. Retrieved 1 February 2014. ^ Edwards, Piers (28 October 2014). "Estadio Santiago Bernabeu: The $500m stadium wrapped in a glowing 'skin'". CNN. Retrieved 6 March 2015. ^ "Real Madrid and IPIC sign agreement to renovate Bernabeu stadium". La Prensa. 28 October 2014. Archived from the original on 2 April 2015. Retrieved 6 March 2015. ^ Duff, Alex (28 October 2014). "Real Madrid Gets Stadium Financing From Abu Dhabi's IPIC". Bloomberg. Retrieved 7 March 2015. ^ Díaz, José Félix (25 October 2014). "Bernabéu sheikh-up: Abu Dhabi coming on board". Marca. Retrieved 7 March 2015. ^ Martin, Sean (19 November 2014). "Real Madrid's Stadium to be Renamed 'IPIC Bernabeu or CEPSA Bernabeu'". International Business Times (UK). Retrieved 7 March 2015. ^ Hall, Joe (28 January 2015). "Real Madrid stadium could be renamed "Abu Dhabi Bernabeu" due to UAE investment". CITY A.M. Retrieved 7 March 2015. ^ "Real Madrid president caught revealing IPIC stadium name". Zee News. 19 November 2014. Retrieved 7 March 2015. ^ "Real Madrid C.F. and Microsoft Launch the First Interactive Audioguide for the Bernabéu Tour". www.prnewswire.com. Retrieved 6 April 2017. ^ "Real Madrid's new Bernabeu to grow over 10 metres in height - MARCA in English". MARCA. Retrieved 9 May 2017. ^ "Real Madrid hope €525m Bernabeu renovation gives them 'best stadium in world'". espn.com. 24 September 2018. ^ "Real Madrid present the new Santiago Bernabéu". AS.com. 2 April 2019. Retrieved 3 April 2019. ^ "Football: Real Madrid unveil plans for 'digital stadium of the future' | The Star Online". www.thestar.com.my. Retrieved 3 April 2019. ^ Sport, Telegraph (2 April 2019). "Real Madrid unveil plans for new Bernabeu with 360-degree screen and retractable roof". The Telegraph. ISSN 0307-1235. Retrieved 3 April 2019. ^ "Santiago Bernabeu revamp set to begin this summer - MARCA in English". MARCA. Retrieved 9 May 2017. ^ Brewin, John (1 May 2008). "European Nations Cup 1964". ESPNSoccernet.com. ESPN. Retrieved 28 January 2013. ^ "Sparkling Italy spring ultimate upset". Glasgow Herald. 12 July 1982. Retrieved 30 April 2014. ^ "Reglamento CONMEBOL Libertadores 2018" (PDF). conmebol. Retrieved 4 December 2018. 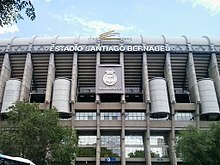 Wikimedia Commons has media related to Santiago Bernabéu Stadium.